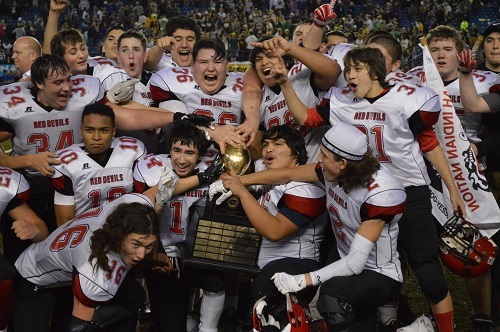 Neah Bay, in their third state final in the last four years, faced off against an undefeated and incredibly dominate Odessa-Harrington Titans team in the 1B Washington state championship. The Titans had put up over 70 points in six games this season, topping 90 in two of those contests. The scores they put up in 8 on 8 football are some of the highest seen, but this did not scare the Red Devils of Neah Bay. Neah Bay jumped out to a quick 12-0 lead and a dominate 34-14 halftime lead against an undermanned Titans lineup. With right around 20 suited players, the Titans faced an uphill battle from the beginning. Neah Bay represents well for a 1B school, and their depth paid dividends throughout this matchup. Neah Bay extended their halftime lead throughout the 3rd and 4th quarters, with Cameron Buzzell averaging 21 yards per carry on his 8 touches, totally 168 yards and 3 scores. He was too much for the Odessa-Harrington defense, who gave up 498 yards in the game. As the Red Devils extended their lead, their confidence continued to grow. Their 303 yards on the ground paid dividends to their limited passing attack, but brought the safety up for deep passes and long conversions. Neah Bay and coach Tony McCaulley went on to capture another state title, with a final score of 64-34. Neah Bay 64, Odessa-Harrington 34. Cameron Buzzell – 4 touchdowns.